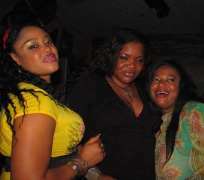 Sandra Achums used to be one of the hot chics of Nollywood back then in the 90s before she relocated to Europe. Well, it may be that Achums has realised that Nollywood has gone global and has come back to be part of it. Lets' not forget that she got married late last year to her beau who is somehow related to a personality in the seat of power in one of the states in Nigeria. Though pregnant, Sandra looks as if she is not going to allow fun pass her by. Our dear actress is still clubbing and she does it with so much pleasure. Life and Beat saw her in a highbrow club earlier in the week where she was having the fun of her life.